We begin by identifying goals and clarifying liquidity requirements for a client’s investments. Sources, timing, distribution, and uses of each client’s cash flows are documented. Assets needed to satisfy short-term (less than five years) cash flow needs are quantified. When possible (i.e. when client engages us for financial planning) the appropriate needs-based analysis is also factored into the investment plan. Determining a risk profile includes identifying the risk tolerance, risk need, and risk capacity for each client. The clients’ risk profile, in conjunction with their time horizon, financial situation and goals, form the foundation of the investment strategy. The investment strategy is communicated to the client through the development of an Investment Policy Statement (IPS). 1Diversification (and/or asset allocation) does not ensure a profit or guarantee against loss; it is a method used to help manage risk. We use the information gathered and stated in the Investment Policy Statement to recommend an appropriate Asset Allocation model for the client’s assets. The Asset Allocation plan defines the specific mix of asset classes that produces the highest historical return given the level of risk that is consistent with a client’s risk profile. This is typically referred to as specification of a portfolio that resides along the efficient frontier. The result is the assignment of an investment model that is consistent with the client’s goals, objectives, time horizon, and financial situation. We employ a comprehensive due diligence process for the selection of appropriate investments that we incorporate into each of our investment models. 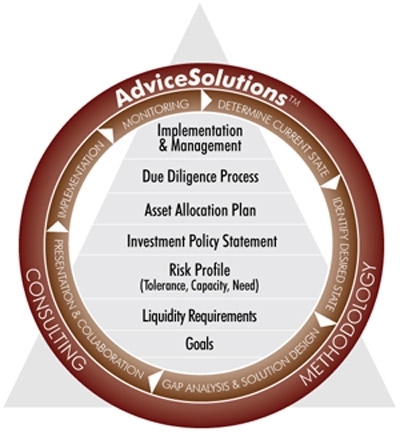 We have developed this due diligence process over many years using several different sources of investment intelligence. Our due diligence process is continually revised, and, we review our models and their investment components on a quarterly basis. A carefully selected ensemble of no-load and/or load waived mutual funds and separately managed accounts are typically used to form most portfolios, although other investment vehicles, such as, but not limited to: Exchange Traded Funds (ETFs), individual stocks and/or individual bonds are used as circumstances warrant. Assets are held in custody at Fidelity Institutional Wealth Services assuring our clients of reliable execution and reporting. Following the implementation of a client’s investment strategy, we monitor the performance of the investments relative to the investment goals. Clients are provided with monthly and quarterly reports on their investment portfolio, target allocations, and related performance information. These reports include the tracking of portfolio holdings, interest and dividend payments, capital gains payments, and overall portfolio performance. We periodically compare the performance of each investment against an appropriate index or peer group, and due diligence procedures defined in each client’s Investment Policy Statement. We will meet with clients on a regular basis according to guidelines established in the Investment Policy Statement to review their current situation and investment portfolio and make any appropriate adjustments. We are Investment Advisor Representatives and will be your primary contact for your investments. Your accounts will be managed by John Engler, Matthew Garrow and Timothy Roth. You will receive an ADV supplement brochure that will inform you of pertinent information about each of these individuals. Sigma Planning Corporation is the Registered Investment Advisor for the investment advisor representatives at Engler, Garrow & Roth Ltd. You will receive an ADV brochure from your investment advisor representative that will give you information concerning this entity. You will also receive a Client Services agreement from this company that will outline the parameters of your relationship to Sigma Planning Corporation, and your investment advisor representative at Engler, Garrow & Roth Ltd. as well as outlining the fees that you will be charged. This company will be the custodian of your investments. This is also the company through which all trades are placed for your account. Our investment management programs are provided on a fee basis. Fees are calculated as a percentage of assets under management and, depending on the client’s preference, can include ongoing financial planning services. For details, please contact our office. For clients who do not desire active management of their investments and the associated fees, we offer an extensive selection of non-proprietary investment products available for retail purchase, including but not limited to Variable Annuities, Fixed Annuities, Fixed Indexed Annuities, Mutual Funds, REITs, Brokerage accounts, etc.